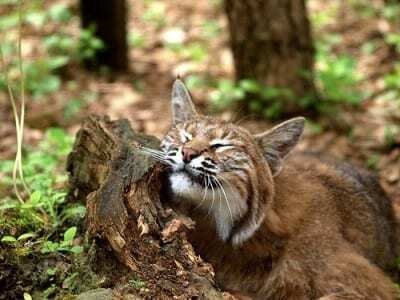 Bobcat are about twice the size of a domestic cat and usually smaller than the Canada lynx. Their fur is dense, short, and soft and is generally shorter and more reddish in the summer and longer and more gray in the winter. Spotting occurs in some bobcats and is faded in others. The face has notable long hairs along the cheeks and black tufts at the tops of each ear. Males are, on average, one-third larger than females. Both sexes can be greater than 30 pounds; however, averages for males and females are 21 and 14 pounds, respectively. Body length for males is 34 inches and 30 inches for females. Tail length is usually between 5 and 6 inches for both sexes. Sometimes sightings of bobcat are confused with Canada lynx. Bobcat can be easily distinguished from lynx by the absence of the huge, seemingly oversized paws and a black-tipped tail that are characteristic of the lynx. Bobcats have paws that are proportional to their body size, and their tail is black spotted. Lynx tracks are roughly twice the size of that of a bobcat. DEC attempted a lynx restoration program in the Adirondacks in the late 1980s and early 1990s, but the animals released there dispersed far and wide and a resident breeding population was never established. Currently, the lynx is considered extirpated in New York because there is no evidence of any remnant population of resident animals.